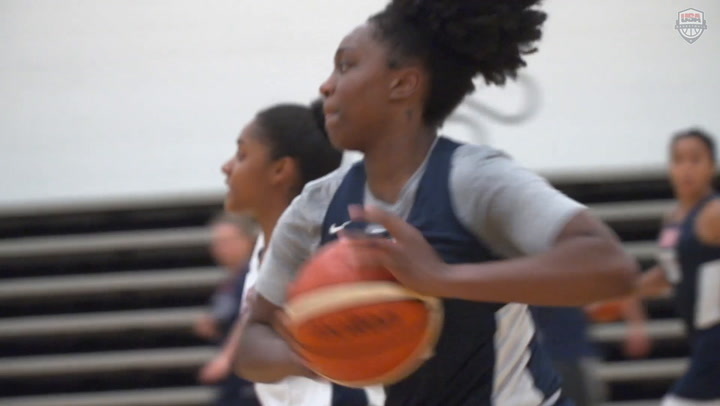 The 2014 USA Basketball Women’s U18 National Team (3-0) rode a game-changing 19-4 second-quarter run to an eventual 107-76 win over previously unbeaten Canada (2-1) in the 2014 FIBA Americas U18 Championship on Friday night at the U.S. Olympic Training Center in Colorado Springs, Colorado. The game saw six lead changes and five tied scores, all of those coming in the first half, before the USA took control. With the win, the USA secured the No. 1 seed out of Group A and will face Argentina (2-1), the No. 2 seed of Group B, in the semifinals at 5:30 p.m. (MDT) on Aug. 9. All games are available live online at www.fibaamericas.com, and admission to the championship is free. Canada will play Group B’s No. 1 seed Brazil (2-1) in the first semifinal at 3:30 p.m. (MDT), and the semifinal winners will meet in the gold medal game on Aug. 10. The four semifinal teams, by ensuring a top-four finish in the tournament, have qualified for the 2015 FIBA U19 World Championship in Russia. Napheesa Collier (Incarnate Word Academy/O’Fallon, Mo.) led the USA with 22 points, 10 rebounds and four steals; and Brianna Turner (Manvel H.S/Pearland, Texas), who finished with 21 points and eight rebounds, set USA U18 women’s records for free throws made and attempted by shooting 9-of-11 from the line. As a team, the USA shot 29-of-33 from the free throw line (.879), and three more players reached double-digit scoring, including 16 points from A’ja Wilson (Heathwood Hall H.S./ Hopkins, S.C.), 11 points from Marina Mabrey (Manasquan H.S./Manasquan, N.J.) and 10 points from Mariya Moore (Salesian H.S./Richmond, Calif.). Wilson and her U.S. teammate Beatrice Mompremier (Miami H.S./Miami, Fla.) suited up for the USA on their 18th birthdays. The USA jumped out to a 9-0 lead to start the game before Canada fought back to tie the score at 11-11 at 5:42 in the first quarter. From there the teams went back and forth, and Canada, which made two 3-pointers in the last 2:20, led 23-21 at the first intermission. The two-point deficit was the first time in the tournament that the USA had trailed at a quarter break. A bucket from Collier to start the second period knotted the score, but Canada responded with another shot from behind the arc, and by the 7:23 mark had built a 33-27 advantage. Free throws from Turner and back-to-back three-point plays from Collier and Moore tied the game up at 35-35 at 6:01. Canada scored once more before the USA launched an 8-0 run to find some breathing room and lead 43-37 at 3:15 when Mabrey scored on a drive to the basket. The next three minutes were played at a frenzied pace. Canada scored at 3:10 to end its drought, but the USA put up five more quick points thanks to a pull-up jumper from Kea and a 3-pointer from Mabrey. Canada’s last points of the quarter came at 1:28 to make it 48-41, but the USA was not finished. Mabrey sank two free throws, and then a steal and fast-break bucket from Collier was followed by a steal and assist from Ariel Atkins (Duncanville H.S./Duncanville, Texas) that led to a bucket from Mabrey at 3.0 seconds, and the USA headed to the locker room with a 54-41 lead. 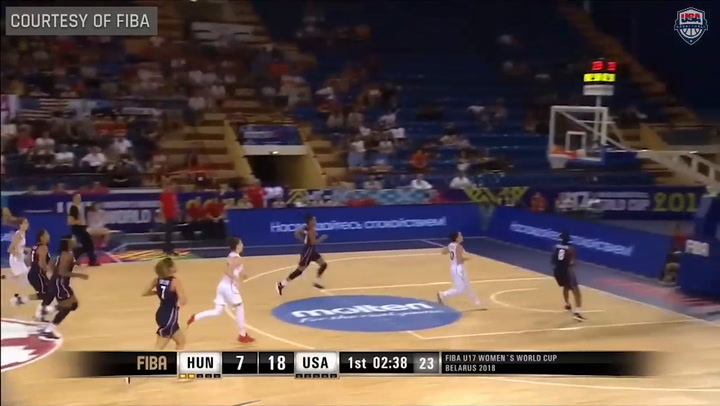 Turner scored the first six points of the second half for the USA as the teams traded scores to make it 60-45 with 8:04 remaining in the stanza. After an offensive rebound and score from Atkins, Wilson tallied 10 straight points for the U.S. to help the red, white and blue lead 74-54 at 2:41. With just 4.6 seconds on the clock, Receé Caldwell (Homeschooled/San Antonio, Texas) collected a missed Canadian free throw and pushed the ball up the floor to find Destinee Walker (Lake Highland Prep School/ Ocoee, Fla.), who just beat the third-quarter buzzer with a 3-pointer to head into the final 10 minutes with the USA leading 83-59. With the game’s outcome secured, the USA went on to tally 24 points to Canada’s 17 to bring the game to its 107-76 final. “They were shooting really well from outside, and so we made some adjustments for that and found a way to stifle them,” Collier said. 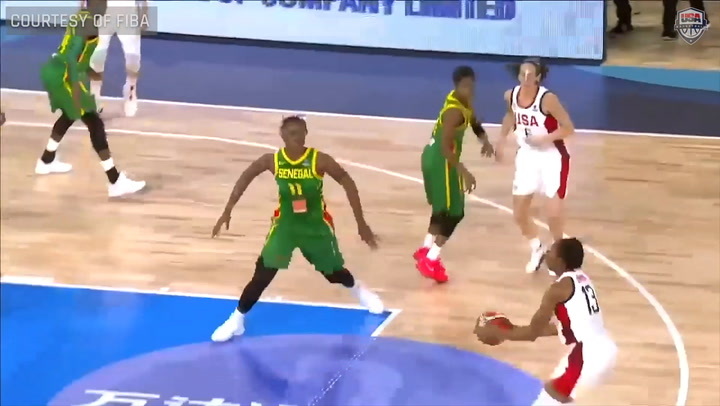 The USA finished with a 45-18 rebounding advantage and forced 22 Canadian turnovers. Shaylisha Colley finished with 21 points for Canada, while Bridget Carleton added 19 points. Also today, in Group B, Brazil (2-1) topped Chile (1-2) 75-63 and Argentina (2-1) edged out Puerto Rico (1-2) 47-44; while in the USA’s Group A, Mexico (1-2) won against El Salvador (0-3) 74-37. Chile, Puerto Rico, Mexico and El Salvador will meet in the consolation semifinals on Aug. 9 and will play our for fifth through eighth places. “We’re ready for the semifinals,” Staley said. “This team has gotten better each time and you can see it by the different contributions we’re getting from people coming off the bench; everyone is a starter in there. When you’re calling people’s numbers and they respond and answer and will us to win, then we’re moving in the right direction for semifinal play. 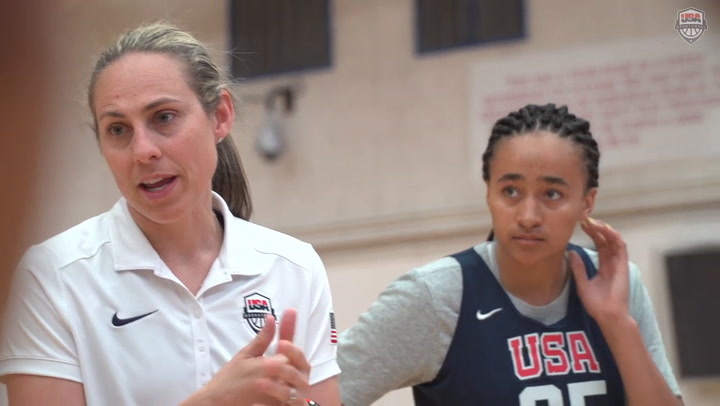 The USA is looking for a seventh-straight gold medal at the 2014 FIBA Americas U18 Championship for Women, and is now 46-2 over all in the event since it was first held in 1988.